* Hair that is colored or permed is acceptable. * Hair cut years ago is usable if it has been stored in a ponytail or braid. * Hair that has been bleached (usually this refers to highlighted hair) is not usable. If unsure, ask your stylist. We are not able to accept bleached hair due to a chemical reaction that occurs during the manufacturing process. **If the hair was bleached years ago and has completely grown out it is fine to donate. * Hair that is swept off of the floor is not usable because it is not bundled in a ponytail or braid. * Hair that is shaved off and not in a ponytail or braid is not usable. If shaving your head, first divide hair into multiple ponytails to cut off. * We cannot accept dreadlocks. Our manufacturer is not able to use them in our children’s hairpieces. We also cannot accept wigs, falls, hair extensions or synthetic hair. * Layered hair is acceptable if the longest layer is 10 inches. * Layered hair may be divided into multiple ponytails. * Curly hair may be pulled straight to measure the minimum 10 inches. * 10 inches measured tip to tip is the minimum length needed for a hairpiece. * Shorter hair will be separated from the ponytails and sold to offset the manufacturing costs. Although the shorter hair cannot be used in the hairpieces, it still greatly helps to reduce costs. * Gray hair will be accepted and sold to offset the manufacturing costs. * Colored hair is not usable if it is colored over bleached hair. 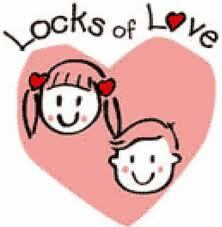 * Because Locks of Love creates custom hairpieces for each child, we are unable to accept donations of wigs, falls, hair extensions or synthetic hair. *The Hair Donation Form is not required to donate hair. If you are having trouble downloading or printing the Hair Donation Form, just write down your name and address on a full size separate sheet of paper and include it in the envelope with your donation so that we may send you an acknowledgement.